We're not sure how many fingers have been lost after people watch Aliens and try to recreate Bishop's Five Finger Fillet stunt. But if you stick to only playing with this lovely knife block, you'll never have to worry about an emergency trip to the hospital. Created by Raffaele Iannello's studio, the faux wooden block is actually made from ABS plastic and will be available in a variety of different colors. 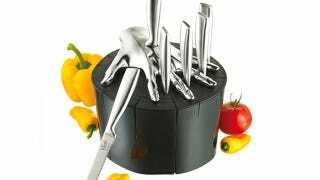 It also includes a set of five inox steel knives and slots all around the splayed chrome hand where you can store them without any fear of ever losing a digit.